This past Sunday was the Substance Project Eco-Race 1 Durham Forest race here in Ontario, Canada. The plan was go and race. But I felt under the weather. However a lot was accomplished. I helped my good friend Tom put together his Lynskey R330 on Saturday. I've known Tom for several years now. I first met him at Tuesday Night Albion Hills MTB races. He showed up at around 10 am with a frame in bubble wrap straight from Lynskey and little boxes of Campagnolo parts. The Lynskey R330 was a limited production run in 2012. Tom was lucky enough to get one. It is one of Lynskey's nicest road frames ever made. This was the end result. One happy Tom. Weight came out to 15.45 lbs with an old heavy saddle as a place holder until a Fizik Kurve arrives. Bottle cages are in the mail. Tom built the wheels himself. They are built to perfection. This is the first time for me putting a Campagnolo bike together. I've put together many bikes for myself and for friends in the past, but Tom is the only one that is riding Campagnolo. Partly because most of us are already established road riders with several sets of wheels. 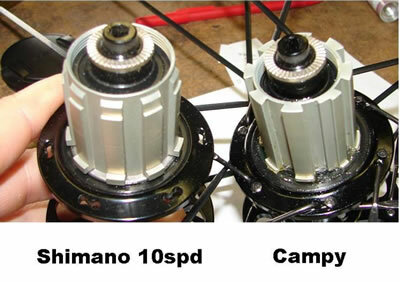 The freehub body for the rear hub for Campagnolo are different than the Shimano/Sram counterparts. Meaning if you already have wheelsets based off of Shimano or Sram you can't go to Campagnolo easily as you can't install a Campagnolo cassette on them. Some rear hub manufacturers allow you to change the rear freehub body and then you would have to potentially redish the wheel.One example is the DTswiss 240s rear hub. There are 3rd party component manufacturers that offer Campagnolo spaced cassettes that fit onto Shimano Freehubs, but those in the past shift like crap. One point to make is that with Campagnolo going to 11 speeds, this forces the cogs to sit further inboard. The 11th cog needs to sit further inboard than Shimano's 10th cog, so if you are running hubs with flanges that are too far outboard (which many hub designs do to maximize lateral stiffness of the wheel) you are going to be out of luck. Wheels manufacturing is possibily the only cassette I would try out if I was going to run Campagnolo and had Shimano/Sram based wheels. So the build went relatively well. I have a vast tool collection and mechanical experience, but some bits of the Campagnolo kit had me reading the instructions and running around trying to find tools. The bottom bracket installation recommended by Campagnolo is to douse the threads with Loctite 222MS and screw in the cups hand tight. I did this, but also added in Loctite 7471 to prime the threads before adding in the Loctite 222MS to speed up the cure. Cups were torqued to hand tight with a rag to increase grip strength. Certain bolts are torx. A good thing, as torx is less prone to tool slipping out of the bolt head. During the build I ran into using both T25, some T20. My tool collection lacked a good quality T20 bit. The lock ring for the rear cassette has a different spline than Shimano (I didn't know that). The chain pin used to connect the chain together requires it to be peened. There is a special chain tool which I didn't have or have time to make one up. In the end all fasteners were torqued using a calibrated torque wrench. The only fastener torqued without a calibrated torque wrench was the bolt for the Record crankset that holds the Hirth joint together for the spindle. This was done using Park Tool TW-2 which I never verified if the sticker for the scale reading corresponded correctly with the deflection beam. So even though the bike was built up, shifting adjusted and bar tape wrapped. It wasn't fully done, Tom needed to visit the local bike store to get his chain peened and the lock ring torqued up. Luckily a local bike shop helped him out free of charge. Nice build up. That LBS was super helpful with the chaintool. Campy chaintools are ridiculous $$$s. It really is, even so, critical to go over Result Wrench Review just before zeroing with virtually any specific design. Employing a great wrench can help the work proceed faster, for more information click here torque wrench review.